Recreation Complexes - Muirfield Association, Inc.
Muirfield Village has two large recreational facilities, the Glick Road Facility and the Holbrook Recreation Complex. The Glick Road Facility is located at 6716 Glick Road and includes a large swimming pool with a diving bay, nine lap lanes, swim area, water slide and baby pool, six lighted tennis courts (several striped for Pickleball) and tennis pavilion, a basketball court, and a state-of-the-art playground. During the summer, professionally-led tennis programs are offered for both adults and juniors. 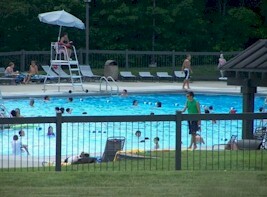 Muirfield's swim team, the Muirfins, practices and holds meets at the Glick Road pool. The Holbrook Recreation Complex, located at 8372 Muirfield Drive, has a large swimming pool with a diving bay, six lap lanes, a zero entry swimming area, baby pool, stainless steel hot tub and spray ground. Four lighted tennis courts, a basketball court and another state-of-the-art playground complete the complex. Nearby is Muirfield's largest fishing lake and gazebo along with a practice putting area. During summer, "Learn to Swim" classes are offered for a reasonable fee to residents. Both facilities include nearby parking lots with access to the pathways. Open, mowed fields are located near both facilities and residents are welcome to bring sports equipment. Restrooms are available seasonally at the pool facilities.